If you’re serious about personal watercraft riding, chances are you’ve invested in – or soon will invest in – a dry bag. The reason is in the name. These relatively inexpensive, easily portable bags keep their contents dry. Not mostly dry or partly dry like many PWC storage compartments will do, but actually dry. Splash them, accidentally drop them in the water, sub the bow of your craft and test the water tightness of that bow storage, and the contents of a dry bag – a change of clothes, wallet, phone, etc – won’t end up damp and soggy. The catch with most dry bags, however, is that you end up carrying them around like a womens handbag. That’s fine for minimal use, but for routine usage I’d rather be able to toss one over my shoulder like a backpack. 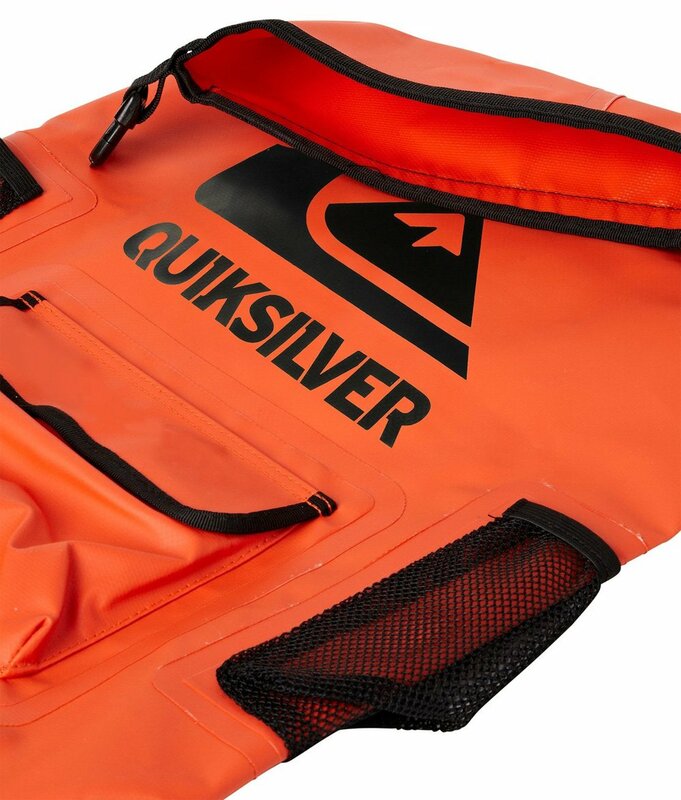 Someone at Quiksilver obviously had the same idea, as the brand’s version of a dry bag is just that – a backpack. The Sea Stash works like most other dry bags. Load your items in through the open top, and then close and keep everything watertight by folding, or rolling the top several times over the nylon web strap sewn onto the exterior of one side of the opening. Buckles on each end of the strap are then connected, the roll is compressed, and water is effectively sealed out without the need of any high-tech closures or cumbersome gaskets. 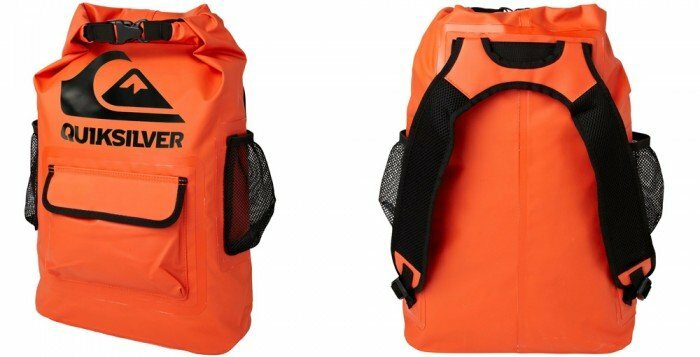 Most dry bags are then carried via the makeshift handle this strap forms, but Quiksilver does things differently by squaring up the normally round dry-bag design (actual dimensions of the Sea Stash are a rectangular 15.5” x 5.9” x 23.6”) and adding comfortable, backpack-style shoulder straps. This enables the user to easily carry the bag when away from the craft, as well as gives the bag a certain coolness factor lacking in conventional dry bags. Quiksilver also goes beyond the norm by giving the Sea Stash a welcome trio of easily accessed outer pockets for gear that doesn’t require a waterproof enclosure. There’s a pair of elasticized mesh side pockets (great for keeping water bottles, sunscreen, etc, handy), as well as a large, velcro-flapped front pocket for any other items you want to keep readily at hand. 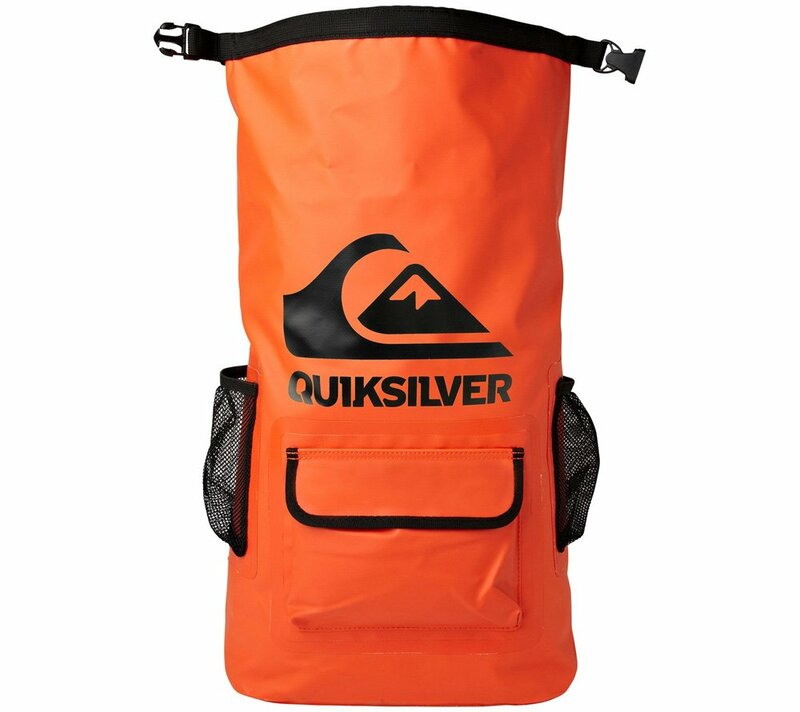 The material is a durable PVC-coated tarpaulin with sealed seams, available in a bright orange (popsicle) for visibility and featuring a prominent Quiksilver surf-and-mountain logo. The latter detail gives the bag an extra dose of that surfy vibe. I’ve used the $55 Sea Stash on multiple occasions and it’s proved quite durable as I’ve loaded it into storage compartments, tossed it into the trunk of the car, laid it on a sandy beach, even used it to carry my gear while riding on a storage-less standup craft. It also proves pretty handy if you have to ride somewhere in the rain on a bike, or hike in inclement conditions. Final verdict? The Sea Stash remains one of my go-to items when riding personal watercraft, venturing out on the boat…or just navigating terra firma. It’s a keeper. For more information, visit www.quiksilver.com/sea-stash-EQYBA00031.html.